The following user guide describes how to create new users for your protel Air hotel software. If you have any questions, please contact Cloud-Support@protel.net. Because the newly developed HTML5-Client does not contain the comprehensive system data management, a large portion of the system data will continue to be managed in Flash Client. This is also the reason why users in Flash Client will need to continue to be managed parallel to HTML Client - see next section. Learn more about creating HTML5 users in section HTML5 user. 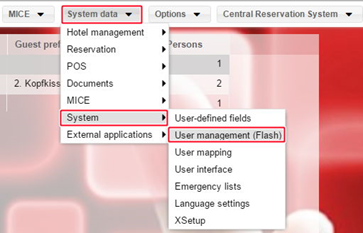 The Flash user management helps you manage which employees are allowed to have access to the Flash system data . The Flash system data provides protel Air with the fundamental data of the hotel (e.g., rooms, rates, items, etc.). In the further course of development, the Flash system data will be implemented into HTML5 client. Until the end of this implementation phase, you will be managing your protel Air system data mainly in Flash-Client. Each employee working with protel Air needs to be a user in both the HTML5-Client and Flash-Client.